Amazon Price: $43.99 (as of October 18, 2017 2:30 pm - Details). Product prices and availability are accurate as of the date/time indicated and are subject to change. Any price and availability information displayed on the Amazon site at the time of purchase will apply to the purchase of this product. 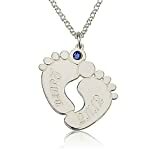 925 Sterling Silver Personalized Baby Feet Name Necklace. Choose any 2 names to personalize this solid Sterling Silver (.925) necklace. Pendant suspends from a shimmering Sterling Silver Link chain. You may choose a chain length. Chain lengths are: 14",16", 18", 20", 22". Please provide personalization details in the Gift note box – or promptly send it to us through Contact Seller after your order has been placed. Necklace thickness is 0.7mm / 0.03" 1" height, Stone Size 2 mm / 0.08" . After order is complete we ship all orders within 24 hours.